The first time I made these delicious muffins was in Canada last summer. In Canada there are raspberry fields where you can go with your own basket and pick up as many raspberries as you want. Then the raspberries you've picked up are weighted and you pay for them. Picking up raspberries this way is much cheaper than buying them in a grocery store and so much more fun. Both I and my husband love raspberries, so we loved to go to pick up raspberries together and try new raspberry recipes after. Some of our favorite recipes were Grilled Salmon with Raspberry Sauce, Raspberry and White Chocolate Tart (delicious, but rather expensive if you buy raspberries in a grocery store), and these lovely muffins. I made them again last week with frozen raspberries and streusel topping with cardamom and the result was absolutely awesome!!! 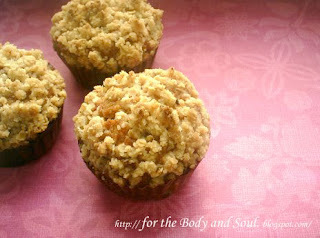 The sweet and spicy flavor of the streusel topping is just a perfect complement to the moist and fruity muffins. The idea of using cardamon in raspberry muffins comes from Dagmar from A Cat In the Kitchen food blog who also made raspberry and cardamon muffins with crumbles a few weeks ago. The recipe for my muffins comes from one of the cookbooks from Le cordon Bleu series published by Könemann. The only thing I’ve changed was the streusel topping; the original one was made without oat meal and spices. Notes to the recipe: You can use either fresh or frozen raspberries in this recipe. If you use frozen raspberries, do not thaw them as they will color the batter pink. If you don't have raspberries, I suspect the muffins would also be delicious with bluberries, bilberries, or strawberries. 1. Heat the oven to 210 C (410 F). Grease or line 12 muffin cups. 2. Sift the flour, baking powder and salt into a large bowl. Add the sugar and raspberries and stir. Make a well in the centre. 3. In a small jug beat lightly eggs and milk. 4. Pour the egg mixture and melted butter into the well. Mix gently with a metal spoon just until the ingredients are combined. Do not overmix, the batter should be lumpy . 5. Spoon into the muffin pan filling ¾ full. 6. To make streusel topping, combine oat, brown sugar, flour, cinnamon, and cardamon in a small bowl. Pour in hot melted butter; stir to combine into crumbs. Sprinkle mixture evenly over top of each muffin. 7. Bake the muffins for 30 minutes or until a tooth pick comes out clean. Cool in pan 5 minutes before removing to a wire rack.